We're still exploring our winter theme & are desperate to play in the snow, but we've no snow here yet. So we created our own snow scene inside! If you're looking for an excuse to sort out your laundry cupboard this is perfect! 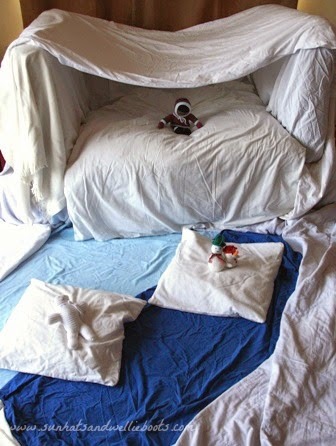 ;-) We raided our cupboard & collected all the white blankets, sheets, & towels we could find. We found a couple of blue sheets which were ideal for creating some icy blue water, & a couple of cushions which we turned into mini icebergs. 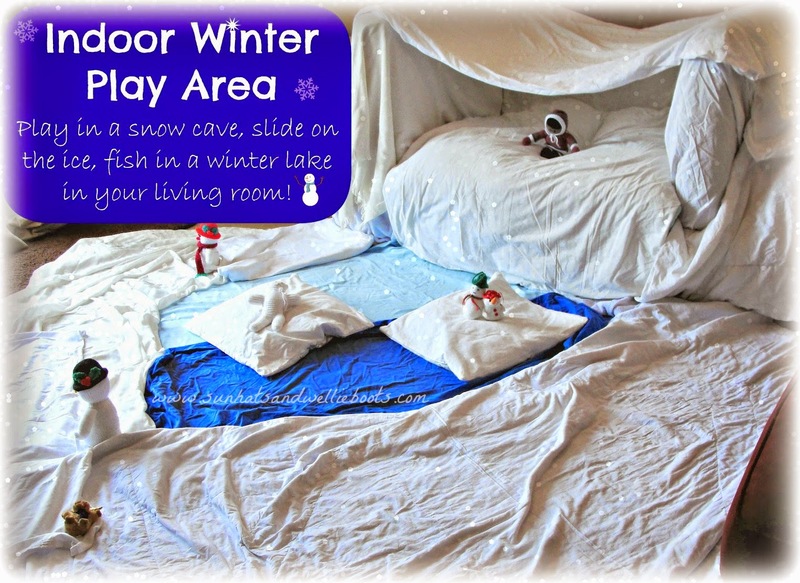 We spread out our white sheets on the floor to create the snow, & then turned our sofa into a snow cave by covering with blankets & towels. 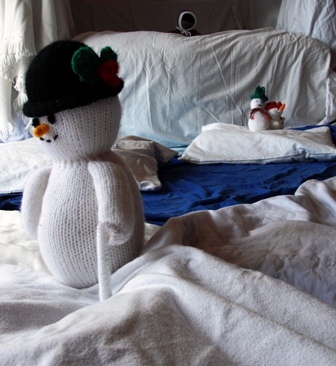 To finish our chilly winter scene we added some woolly snowmen, penguins, polar bears & an Inuit. They were soon exploring their new surroundings & Minnie was keen to huddle them together in the snow cave to keep them warm! So much physical & imaginative play flowed from this play scene. Minnie leapt across the snow (trying not to fall in the water), jumped on & across the icebergs, & enjoyed curling up & hiding in the cave. 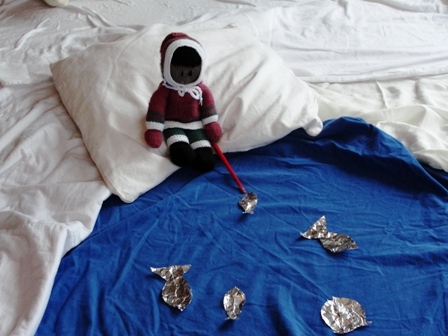 Her Inuit was keen to go fishing (with her fishing rod made from a paintbrush) & managed to catch several foil fish, before the 'pengens' went for a swim & frightened them! 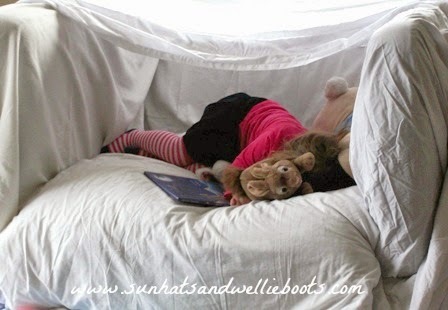 She read & sang to her toys inside the cave, & later independently collected all her white coloured toys to play hide & seek with them in the snow! Then to her surprise a snowstorm arrived! 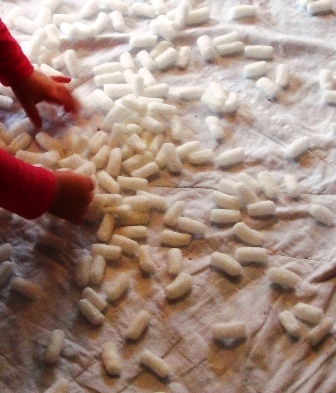 I'd found a bag of white packing peanuts & threw handfuls of them over the snow scene. Soon Minnie was dancing in the snow & trying to catch them as they fell all around her. Her giggles were infectious as we both threw the snow around the play area & over each other. ﻿﻿﻿The icy water & snow have now cleared but the snow cave remains! Minnie plays with it regularly & today she turned it into a ice-cream shop!! I love the way simple materials can create such magical worlds, & spark so much imagination.